Today's polls, conducted over the holiday weekend, are to be taken with a grain of salt. However, they match grumbles that have been coming out of the Conservative campaign. - a lead in BC. Interestingly, Ipsos had the Greens at 3% in BC, while EKOS has them at 18.7%. This basically cannot be explained by statistical noise, even with small samples. Things appear to be moving. 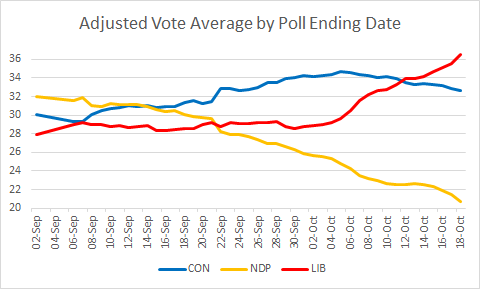 If polls in the next two days confirm these trends, the Liberals would quickly catch up in the adjusted projection. Steven Harper in his campaign ad this morning, touting the benefits of the Conservative's Income Tax Splitting play. The Conservative campaign in shambles, the economy sinking fast, the politics of divisiveness pressed by the Conservatives falling in tatters around Mr. Harper, and the most important thing that he has to talk about in the waining 6 days of his campaign is income splitting? The Conservatives are in serious trouble. The campaign, and more seriously Mr. Harper, have been totally tone-deaf to the real issues concerning Canadians, which are the economy, jobs, and the future direction of Canada. None of these are being addressed in the Conservative campaign to date. The Conservatives have in their campaign totally squandered a massive pile of resources and goodwill (not to mention a huge warchest of campaign money, now wasted on useless attack ads against Mr. Trudeau). Once firmly supported by ethnic minority and immigrant groups in Canada, the Conservatives have alienated all of these groups with their misguided and un-Canadian policies on citizenship, refugees, immigration, the Niquab, and draconian public safety policies, all in an effort to pander to their supposed core support group in Western Canada. What Mr. Harper and the Conservatives have overlooked is that their supposed heartland of Western supporters is hurting, and hurting badly. This demographically-shrinking group has been hard-hit by the collapse of the energy economy and the loss of jobs in the West, jobs which are not coming back anytime soon. The Alberta Provincial election was not a fluke, and these same voters are more than intelligent enough to know that their salvation does not lie with blind support and votes for a Conservative Party that has done nothing for them in the last four years on the economic and jobs front, and has nothing to offer for the future except austerity and a "balance budget". Mr. Harper with his well-hidden fundamentalist Christian beliefs is out of step with Canadians, and out of step with Canadian values. Hopefully the election in six days will result in a severe chastening of the Conservative Party, and the demise of Mr. Harper, Mr. Kenney, and their ilk as its leaders. There is room in Canada for a true Conservative Party, but the current iteration of the party under Mr. Harper is a poor representation of what conservatism should be in the Canadian context. I'm guessing lots of Conservatives are uncomfortable with the campaign Harper is leading. I would hope so, anyway. Nigel, Amazingly well said! Absolutely on point! Great campaign by the prime minister. Joline, with all due respect, to say a campaign run by the PM which focused on Justin's hair, or the Niqab, exploiting divisions between the various races, or calling everyone who wants to lend a helping hand to the helpless as appeasers etc, was/is a great campaign seems disingenuous to put it mildly. I'll say it here, as I have elsewhere when anyone opts to engage in anti-religious bigotry, such as your comment about PM Harper supposedly having a "hidden fundamentalist Christian" belief system...... using a smear comment like that as a tool of engendering fear and division is simply bad. It evidences a form of intolerance all too frequently encountered among supposedly "liberal" minds that engage in a deprecation of other groups they identify as being unlikely to agree with their own worldview. Deprecation leads to insult and insult leads to dehumanizing. It is all quite pathetic. ElectionWatch, I have a quick question, Do you think a liberal majority is a possibility. I know the debate has all been about a conservative majority or minority or a liberal minority. Its just that I dont hear anyone talk about a liberal majority and was wondering in your models if you see even an external likelihood. Do they have to win seats in Quebec to get there because otherwise I just dont see it but wanted to know your thoughts because I dont know if Justin is campaigning all that much in Quebec. Assuming that swings from current levels are uniform across the country, they'd need something like 39-40% for a majority. In such a scenario, they'd get 35-40 seats in Québec on 32-33% of the vote, and about 80 seats in Ontario on 46% of the vote. 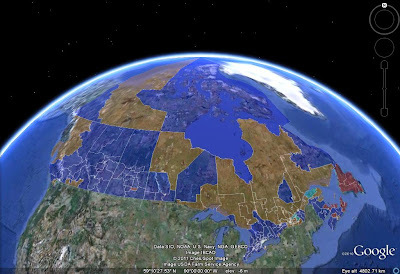 We're talking 25 in the Atlantic (not that different from now), 10 in MB/SK/AB (mostly from some breakthroughs in AB), 15 in BC, and the territories. 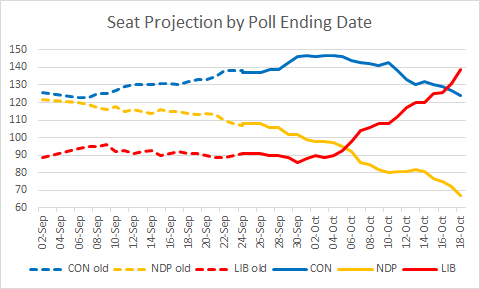 It's fantasy at this point, but may not be fantasy come next Monday if the Liberals keep rising. I'd say the rest of the world is fed up with refugees as the latest incidents in Europe doesn't lie! I personally don't feel safe with hidden identity and only forsee a major problem that lies ahead. According to American and British Intelligence Canada made 2nd on list for top terrorists activity under the Liberal party of Jean Chretien. The London bombings was orchastrated by Abu Bannon under a Rogers account in Toronto. We had the Tamil Tigers seek refugee status in Canada but in return terrorized law enforcement officers and conducted major fraud to fund their rebel movement targeting the government at home. The reality is terror is real in Canada and I personally hold the Liberal party accountable. Since Harper took office things have changed drastically seizing terror networks and gangs. In 2015 crime in Canada has reached its lowest since 1969! Canada this year made the top spot in the world for the best reputation as our economy did not crash like most places around the globe. The world is in a financial crisis and Canada held up their end quite nicely I must say. 80% of Canadians agrees with Harper that Canada should not adopt the values of a culture that humiliates and disrespects women. Canadians also agree that anybody who commits an act of terror or engages should have their citizenship revoked. The Liberals have destroyed Canada on a provincial and federal level. @OldStockCanadian: Given your handle, I can't quite tell if your post is a parody of what the Tories want people to believe, or if you're actually serious.